Rare Civil War map with remarkable abolitionist provenance. Colton's New Topographical Map of the Eastern Portion of the State of North Carolina with Part of Virginia and South Carolina from the latest and best authorities. This is an impressive large scale 1863 J. H. Colton map of the eastern part of North Carolina during the American Civil War. It is from the library of Union Brigadier General Edward Augustus Wild, the abolitionist leader of the United Stated Colored Troops. 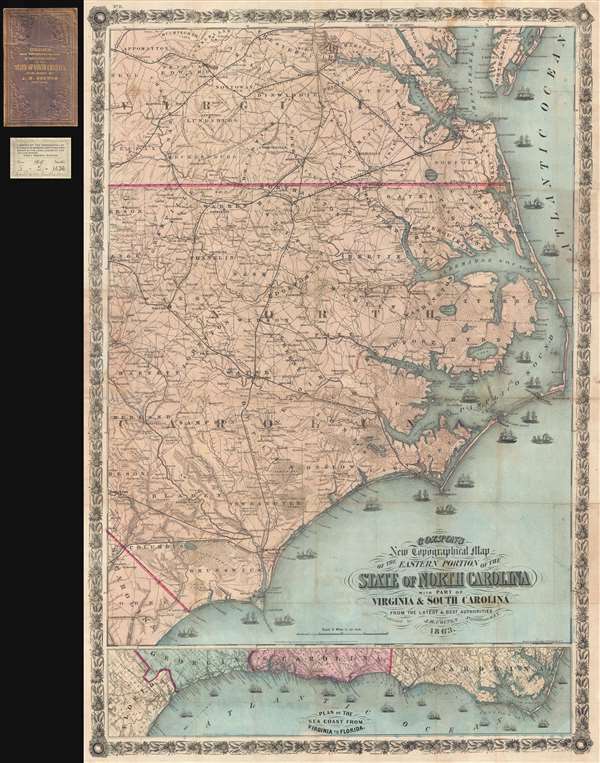 This stunning map covers from Virginia and the entrance to the Chesapeake Bay to South Carolina, focusing on the eastern part of North Carolina and the Outer Banks. The Union blockade of the North Carolina coast is illustrated by the presence of 18 ships. The topography throughout is beautifully detailed with rail lines, towns, swamps, political boundaries, and more identified. Along the bottom of the sheet, a secondary map, 'Plan of the Sea Coast from Virginia to Florida offers an overall picture of the Atlantic seaboard during the war. This map comes with a fascinating provenance. It was originally owned by Union Brigadier General Edward Augustus Wild during the American Civil War. Wild was a staunch abolitionist and organized and commanded the United Stated Colored Troops, an infantry regiment comprised from freedmen recruits. 'Wild's African Brigade,' as it came to be known, was headquartered in Norfolk and comprised the 55th Massachusetts Infantry, and the 2nd and 3rd North Carolina Colored Volunteers (which later became renumbered as the 36th and 37th U.S. Colored Troops respectively). Wild's men served primarily in North Carolina – as covered by our map – and took part in meaningful action against Confederate guerillas, where they destroyed rebel camps and freed hundreds, if not thousands, of slaves. Wild's signature appears on the inside of the binder. From Wild, the map passed into the hands of the Boston based 'Library of the Commandery of the State of Massachusetts Military Order of the Loyal Legion of the United States,' whose pastedown, also bearing a reference to Wild, is included. It was next acquired by Harvard University, who sold it in their duplicate sale on March 5, 1947. The identifier 'No. 11' appears in the upper left corner, suggesting that this map may have been part of a series intended to illustrate the events of the Civil War, and indeed we have identified a more common but similar map Colton's Topographical Map of the Seat of War in Virginia, Maryland … as part of the same series. There appear to be several issues of this map. Our example, printed by Lang and Cooper, bears a copyright of 1860 and an issue date, under the cartouche of 1863. Another version, printed by Lang and Laing, a predecessor of Lang and Cooper, appears with an 1861 copyright date, and an 1862 date under the cartouche. Rumsey suggests that this map first issued in 1861, despite the 1860 copyright, and was last issued in 1864 – although we have found no examples of that edition. Today this map is exceedingly rare outside of institutional collections. Lang and Cooper (fl. August 16, 1862 - May 2, 1864) were a New York City based engravers and printers active in the middle part of the 19th century. The firm was founded by William Lang and Henry Pooley Cooper. The firm came into being following the dissolution of Lang and Laing where in Cooper took the place of Joseph Laing. In May of 1864, Cooper bought out Lang's shares and subsequently published under his own imprint, H. P. Cooper. They specialized in transferring copper and steel plates to lithographic stone for more economical printing. Among others, the firm worked with J.H. Colton and J. Disturnell. Very good. Backed on archival tissue and removed from, but accompanied by, original binder and old library stamp. Minor fill repair to upper right margin, just to the right of the letters 'ATLA' in 'ATLANTIC' impacting printed area by about 1mm. LC Civil War maps (2nd ed.) 304.85. Stephenson 304.85. Rumsey 3044.000.